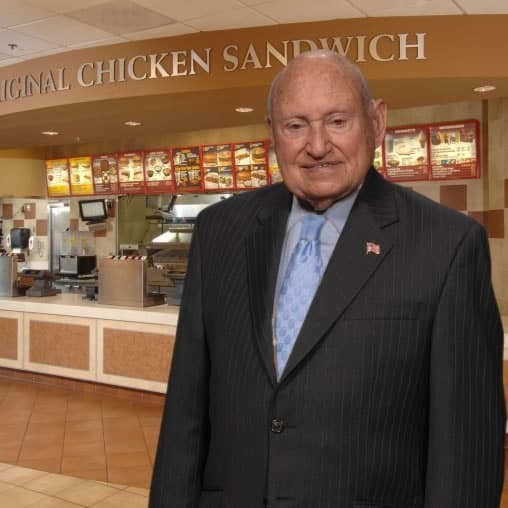 S. Truett Cathy was founder and chairman emeritus of Chick-fil-A, Inc. Cathy started the business in 1946, when he and his brother, Ben, opened an Atlanta diner known as Dwarf Grill (later renamed Dwarf House®). Through the years, that restaurant prospered and led Cathy to further the success of his business. In 1967, Cathy founded and opened the first Chick-fil-A restaurant in Atlanta’s Greenbriar Shopping Center. Today, Chick-fil-A has the highest same-store sales and is the second-largest quick-service chicken restaurant chain in the United States based on annual system-wide sales. Truett Cathy passed away in 2014. Cathy built his life and business based on hard work, humility and biblical principles. Based on these principles, all of Chick-fil-A’s restaurants operate with a “Closed-on-Sunday” policy, without exception. Chick-fil-A founder Truett Cathy has joined ranks with the saints in Heaven. Hear a clip from an interview FamilyLife Today did with him from 2005, along with some recent reflections from Truett’s sons, Bubba and Dan Cathy. On today’s broadcast, Chick-fil-A president and founder, Truett Cathy, tells you how you can make a difference in the life of a child.